A transformational hike in the mountains results in a profound emotional release for Nancy King, leaving her with a lingering sense of solace and clarity that had previously proved elusive. A 10-day recovery period of face-down immobility was a nasty surprise for Thomas Gump when a visit to the ophthalmologist quickly transformed into retinal eye surgery. Suddenly, the unexpected ordeal left him as dependent as a child and wondering what a life without sight might be like. I don’t mean to get too personal here, but I thought it was worth noting that I am not perfect and neither are you. Like I said, it is nothing personal. I am not trying to put either of us down. 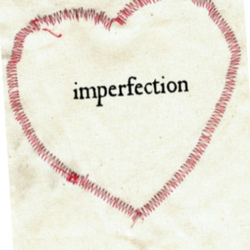 I am simply trying to travel through the world of imperfection, hoping to come out the other side. You see, I spent the better part of my life thinking I was perfect, or at least trying to be. I am your typical highly educated and highly neurotic white woman who has recently become a single mother of three young children. At the age of forty, I have already gone through two marriages and more jobs than I care to admit. I have struggled with the idea of how to find happiness and read almost every self-hope book made. Notice I used the word almost, because no one could possibly read them all. There are simply too many out there. For the past nine months or since the failure of my second marriage, I have been casually dating myself. Rather than curling up in a ball, which is what I want to do every day, I keep washing my hair and forcing myself to go outside. On the weekends, I sometimes go to nice restaurants and sit at the bar. This is usually followed by a movie and a long ride home to my house in the country. This weekend I spent the better part of my Sunday sitting on an isolated beach reading, “How to sleep alone in a King-size bed”, and I realized something profound. I realized that I am far from perfect and even though I have made many positive changes which I think will ultimately lead me to happiness; I am still far from it. Anthony’s dead. These are the two words I hear as soon as I wake up. Anthony’s dead. If I’m not concentrating on something else, these two words creep into my mind. Sometimes I play with them. I mentally say them as a question, an exclamation, I shout them, whisper them, deny them but nothing changes, Anthony’s still dead. Anthony McGregorMy mother had passed away at the end of March and I thought I’d be an old hand at this funeral business. My mother was 89 and in poor health. 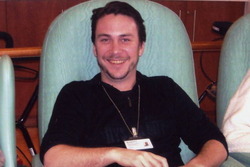 Anthony, my younger son was 33. An accident caused the loss of a productive life. As a gerontologist he was supposed to look after me in my old age. I was worried that looking for photos for the memorial would be painful. Surprisingly it was not. As a photographer I have six or seven albums of the children so my brain was kept busy as I relived the past. Together my family and I made the final cut. We remembered and laughed. There was Anthony, in the red rubber boots he loved, sitting on the potty. I hoped if I saw Anthony the words would go away. Regardless, I had to see him one last time.